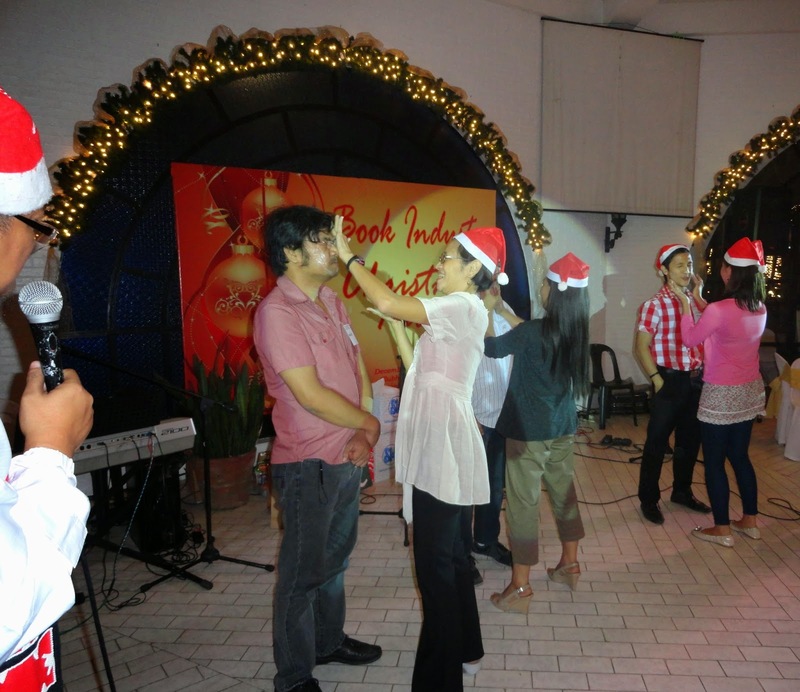 The Book Industry Christmas Party was held last Dec. 13, 2011 at the Clubhouse, Valle Verde IV, Pasig City from 7:00 p.m. till 11:00 p.m.
Members of the Book Development Association of the Philippines (BDAP) celebrate with partners from the National Book Development Board (NBDB) and Unyon ng mga Manunulat sa Pilipinas (UMPIL). More than a hundred guests made up of writers and publishers attended the merry event. During the first part of the program, the election for new members of the Board of Trustees of the Book Development Association of the Philippines (BDAP) took place. Then dinner was served as Symfonia band played great music. FILCOLS Executive Director Alvin Buenaventura gave the welcome remarks. He called Ms. Ani Almario-David to introduce the Guest Speaker. The Guest Speaker was none other than Ms. Neni Sta. Romana-Cruz, the newly-appointed Chairperson of the National Book Development Board (NBDB). She delivered her message to the stakeholders of the book industry. According to her, she cannot contain her excitement to work for the betterment of the book industry and that she is ready for all the challenges ahead. Ms. Neni Sta. Romana-Cruz, NBDB's new chairperson. After her message, some games were played out. Writers and publishers readily formed their own teams to compete in some wacky parlor games. All of the participants received their prizes from Vim Nadera, Angeline Montilla, and Alvin Buenaventura tandem. Nadera is associate professor at the University of the Philippines Diliman while Angeline Montilla works as a model. "Santa Claus" Vim Nadera with "angel" Angeline Montilla and "reindeer" Alvin Buenaventura. Buenaventura called Lirio P. Sandoval, the BDAP's outgoing president. He gave a testimonial for Dr. Dennis T. Gonzalez, the former Chairperson of NBDB. In behalf of the BDAP, Mr. Sandoval also awarded a plaque of appreciation to Dr. Gonzalez for good governance, for all the things that he has done for the industry, and for the partnerships that were very beneficial to Filipino publishers, writers, and readers. Dr. Gonzalez was very pleased with the surprise testimonial for him. He responded with a message that narrated his journey with the NBDB and the whole book industry. He shared that the past administration had attempts to demolish the NBDB. That was ten years ago, before he took over. He also shared that initially, he just wanted to apply the lessons he learned in the academe in a government agency. And NBDB was just the right agency for him. And the result was overwhelmingly helpful and beneficial to everyone. After Dr. Gonzalez's response, the parlor games resumed. Raffle prizes were also given away. Publishers and authors enjoyed the games facilitated by Vim Nadera and model Angeline Montilla. Before the night ended, Esther Pacheco, one of the advisers of BDAP, announced the election results. The complete list will be provided very soon. This article was written by Beverly W. Siy. You may repost or publish it anytime, anywhere for free as long as the author's permission is sought. Email filcols@gmail.com.